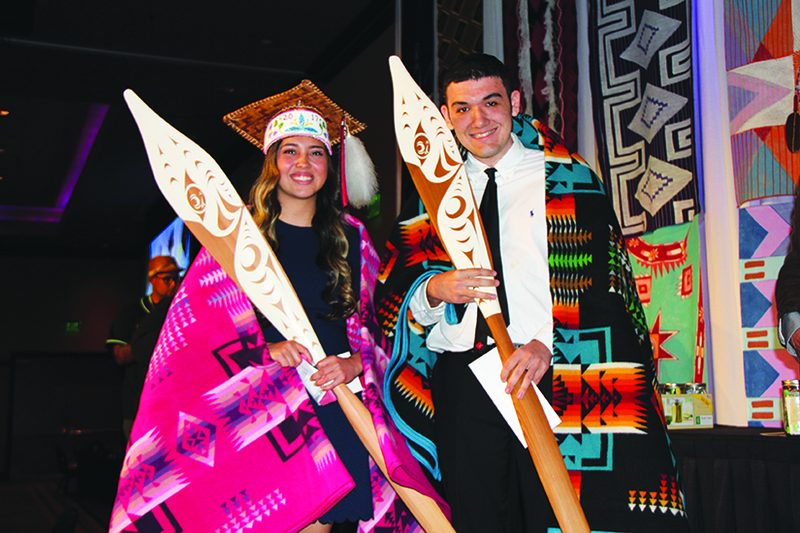 Tulalip Tribes senior girl and boy student of the year are Myrna Redleaf and Carter Wagner. On Friday, June 16, the Tulalip Resort’s Orca Ballroom was home to the Graduation Banquet held for the Tulalip tribal member graduating class of 2017. 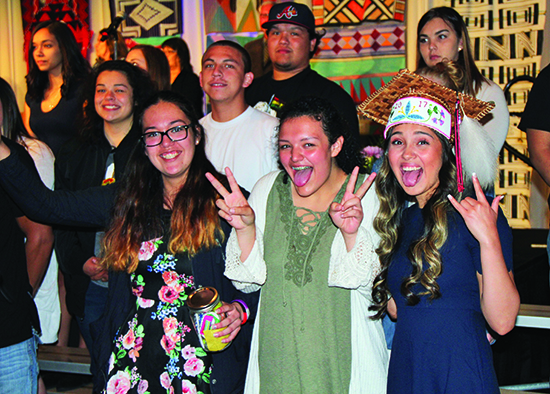 In all there were seventy-four high school graduates and sixty higher education graduates who, accompanied by their friends and families, convened for an evening to commemorate the rite of passage. There was entertainment, a catered buffet-style dinner, and plenty of motivational speeches from their peers and elders reminding the graduates this is just the first step on the path to success. The Marysville Getchell High School band provided good music and lively tunes for the first hour of the celebration, while Board of Director Mel Sheldon controlled the mic as emcee. Graduating seniors Keely Bogin-McGhie and Lukas Reyes, Jr. both took stage and offered encouraging words to fellow graduates. They each told a favorite high school experience, thanked their families for always supporting them, and shared their excitement for great things yet to come in their bright futures. Educator, poet, higher education administrator, and voice for his generation, Christian Paige provided a truly memorable keynote speech that left many in the crowd feeling inspired. He is a first generation college graduate who has committed himself to empowering others to reach for goals larger than themselves. “The individuals in this space are making room on their shoulders for the next generation. It is powerful to know that you are setting the example and paving the way for the people to come after you, for they will know where it is to go by witnessing what you have achieved,” said HOPE initiative founder Christian Page. “We come from cultures with a long, rich lineage of beauty and strength based upon overcoming adversity. The generations before us weren’t given access to traditional literacy, so they had to tell stories in order to keep our traditions and histories alive. Following the keynote speech a special recognition ceremony was held to honor the Tulalip Tribes senior boy and girl student of the year. Myrna Redleaf, a graduate of Tulalip Heritage High School, received the female student of the year honors. Myrna was very active during her high school years; participating in many student activities while being an ASB officer and playing varsity basketball and volleyball. Her teachers said she was “an exceptional individual and student in every way and it was a privilege to know her. She’ll be successful in any career field she chooses. Her ability to multi-task while maintaining priorities is exemplary, as evidence by her balancing a 3.9 GPA while being a two-sport athlete.” Myrna plans on attending Everett Community College in the fall to get her Associated Degree before moving on to a University. Carter Wagner, a graduate of Lakewood High School, received the male student of the year honors. Carter was on the honor roll for his junior and senior years, was a member of his school’s drama program, and is an avid snowboarder. His teachers say “we wish we had more students like him. He’s a very thoughtful and intelligent young man who participated in class discussions and always did well on his tests.” Carter has received an academic scholarship to attend Pacific Lutheran University in the fall where he plans to get a degree in Business Administration. Congratulations to all those Tulalip Tribal students who put in the hard work and dedication to earn their graduate status. Chasing a dream requires your efforts and passion. The hard work isn’t over now that you have graduated, it’s only the beginning as you now prepare for the new challenges waiting in the next chapter of life. Good luck and congratulations! Native doctors, nurses and dentists are greatly needed throughout Indian Country. The Association of American Medical College released a study showing that since the early 2000’s, the number of Native American students entering the medical field has decreased significantly. Currently, about 150 Native students begin pursuing a healthcare profession annually. Ten short years ago that average was 470. Meanwhile, tribal members nationwide continue to struggle with health issues, namely diabetes and heart disease. 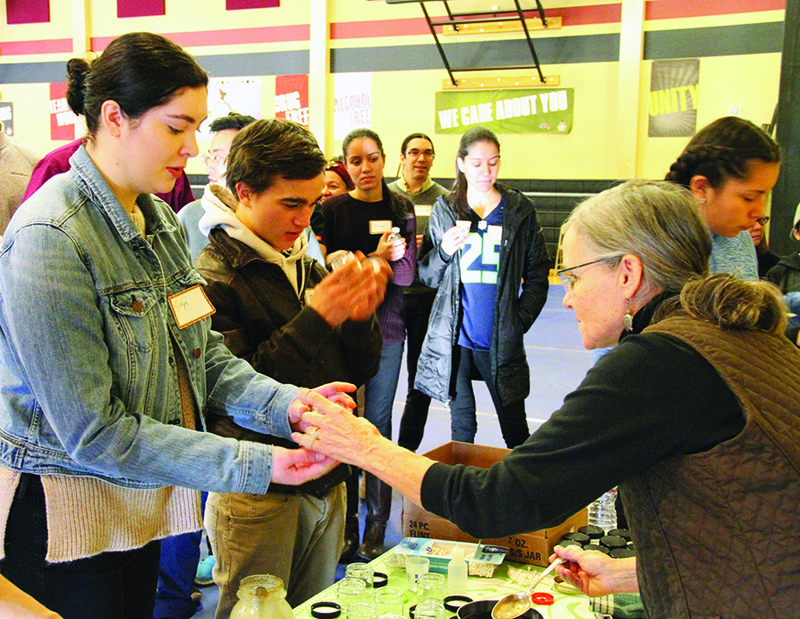 In participation with the University of Washington School of Dentistry, the Tulalip Tribes hosted ‘Empowering the Youth for Health Careers’ Potlatch. 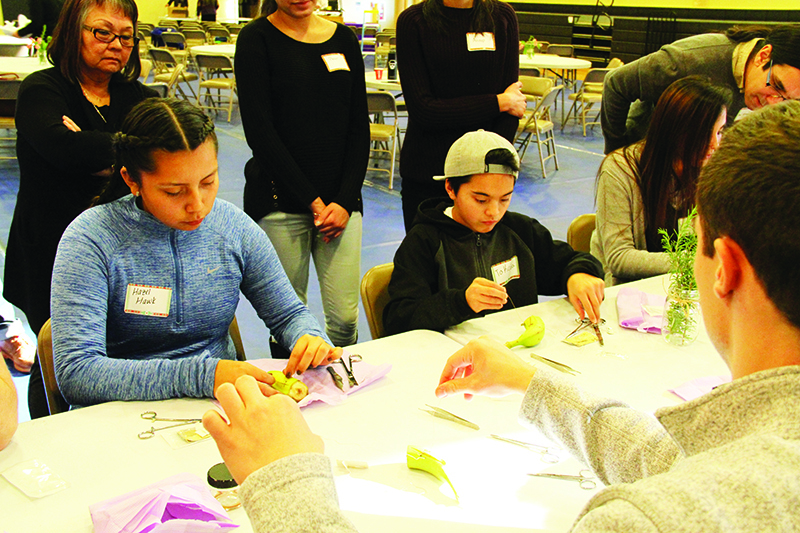 The January 14 event provided the youth of the Tulalip community information, hands-on experience and advice for college preparation for those interested in pursuing a career in healthcare. “We want to ensure that when anybody, youth to elders, walks into a clinic and they are in need of help, we can provide them with an alternative to what comes in a pill bottle,” stated Mohawk tribal member, Dr. Terry Maresca. During a live demonstration, Dr. Maresca used mixed berries, honey and various plants such as sassafras to make a traditional home remedy for the average cold. She spoke of the importance of using traditional teachings in the modern medical industry. Dr. Jason Deen of the Blackfeet Tribe is a UW alumnus and Pediatric Cardiologist at Seattle Children’s Hospital. Dr. Deen spoke about his personal experience, from college to his current position, in the professional healthcare world. Dr. Deen then advised the youth on the steps needed to take in order to be well-prepared for college. The event included hands-on learning where participants, using bananas, learned the suturing technique dentists use when their patients need stitches. Representatives from local colleges including Everett Community, Shoreline Community, and Bellingham Technical were in attendance and provided information about the programs their schools offer, respectively. Rapid City is among the defendants that may be sued in federal court by the Native American students who were the targets of alleged beer-spilling and racial taunts at a January hockey game in the Rushmore Plaza Civic Center. A Minneapolis lawyer, Robert R. Hopper, has filed in the U.S. District Court of South Dakota a “pre-suit notice” alleging “atrocious behaviors” by some of the defendants at the Jan. 24 Rapid City Rush game. State law requires that to sue a “public entity,” such as the city, over some incident, written notice must be given within 180 days of the incident. Thus, the deadline for giving the city written notice occurs this week. Named as prospective defendants in the yet-to-be-filed suit are the city of Rapid City, which operates the Rushmore Plaza Civic Center, in which the Rush play their games; Eagle Sales of the Black Hills, which leases the luxury box from which the beer-spilling and racial taunts reportedly came; Trace O’Connell, a Philip resident who has been charged with disorderly conduct in connection with the incident; and “other guests of Eagle Sales’ box suite” on the night of the game. Rapid City Mayor Steve Allender on Saturday said he had “skimmed” the pre-suit notice and has scheduled an executive session at the Monday night Rapid City Council meeting for council members to discuss the possible lawsuit with legal counsel. “I guess it wasn’t unexpected,” Allender said. “It could very well be that the impact might be to elicit a settlement” from the defendants, he added. An attempt Saturday to reach an executive with Eagle Sales was unsuccessful. Some of those accusations are familiar, although the references to thrown bottle caps and Frisbees apparently are new. Those actions, the notice says, “were allowed to perpetuate and were exasperated by the negligence of the Civic Center and its responsible agents and employees acting in their official capacity on behalf of the City.” In an email, Hopper said “exasperated” should have been “exacerbated,” and he explained that an auto-correct feature on his computer made the mistake. The students, all from the American Horse School on the Pine Ridge Indian Reservation, were at the game as a reward for academic success. They were accompanied by adult chaperons. The group had 65 tickets to the game. After a lengthy investigation, O’Connell was charged with disorderly conduct, a Class 2 misdemeanor. His trial is scheduled for Wednesday and Thursday this week in the Historic Theatre at Rapid City High School. Haskell Indian Nations University (“Haskell”) is the premiere tribal university in the United States offering quality education to Native American students. Haskell’s student population averages about 1000 per semester, and all students are members of federally recognized tribes. Haskell’s faculty and staff is predominantly native. Haskell offers Associate and Bachelors degrees. Haskell’s historic campus is centrally located in Lawrence, KS in what is known as Kaw Valley. Today, after more than 130 years of existence, Haskell is experiencing extreme funding shortfalls and reducing the necessary funding to provide educational as well as student extracurricular activities, such as athletics, educational field trips and generally preparing students for life after degrees are obtained. In 1884 Haskell initially opened its doors to American Indian students as Haskell Industrial Training Institute. Today Haskell has emerged from those early years as a vocational/commercial training institute that initially offered a 5th grade curriculum, followed by an 8th grade curriculum, and by 1921 a full-scale 12th grade high school curriculum and maintained until 1965. In 1970 Haskell became an accredited junior college and by 1994 Haskell attained university status when it began offering both associate and baccalaureate degrees. During the existence of Haskell, there have been consistent academic/training alterations and changes to the methods and emphasis of training and teaching at Haskell (manual training courses, agricultural training, commercial courses, normal educational development, grade school/primary school education, high school development, domestic arts, domestic sciences, junior college, and finally university status). But the one constant has been athletics and its role as a viable part of Haskell’s development. Haskell’s first organized sport against competitive opponents was football which began in 1896 and from 1919 to 1930 Haskell developed one of the most successful athletic programs in the school’s history recording a won/loss record of 94-31-6[JD1] . Haskell competed collegiately during this time and played some of the most formidable teams during that period of time including Kansas University, Oklahoma University, Notre Dame, Oklahoma A & M University, Tulsa, Nebraska, Boston College, Minnesota, and Bucknell. The Hominy Indians were an all American Indian professional football team, meaning The Real Americans, located in Hominy, Oklahoma. The financiers were from Hominy, the Osage Tribe, and other tribes – the players were from all over. On December 26, 1927, they defeated the National Football League New York Giants who were titled world champions three weeks prior to the game with the Hominy Indians. Hominy was short handed of players and asked Haskell if they had any players willing to play with Hominy. Several eagerly accepted and were an integral part in helping Hominy in beating the NFL Giants 13-6. Tommy Anderson, a Muscogee Creek stood as the premier running back in 1919, but the greatest team is believed to be the 1926 undefeated team that went 12-0-1 and was the first team to play in the newly built 10,500 seat stadium built with the exclusive donations of American Indian people. The largest contributors, were Osage and Quapaw tribal members who at that time were beneficiaries of oil and other mining resources. The 1926 team had the benefit of what may have been the greatest all-around backfield in Haskell’s history including Elijah Smith who was the fastest of the running backs; George Levi performed as both an inside and outside runner; Mayes McClain served as the fullback and the team’s leading scorer (scoring a record 253 points, a scoring record that stood for 80 years); and Egbert Ward, ran the quarterback position. In addition to the potent running and passing utilized by the 1926 team the team also had two of the best linemen in the nation. Tiny Roebuck and Tom Stidham (Mayes McClain would lead the nation in scoring in 1926 and his record of 253 points scored in a season was a record that stood for nearly 80 years. Tom Stidham would eventually coach collegiately at various universities including football at the University of Oklahoma. The 1926 team ended the season considered among the top collegiate programs in America. In the 1929 and 1930 seasons, Haskell maintained a record of 8-2-0 and 10-1-0. The only loss in 1930 was to the University of Kansas, the following year, 1931, Haskell defeated Kansas in their re-match. Rabbit Weller, a Caddo from Oklahoma who would go on from Haskell to play football professionally. Buster Charles, an Oneida from Wisconsin led Haskell during this period of time and would eventually compete in the 1932 Olympics in the decathlon, a series of 10 events that commonly is said to determine the best all-around athlete in the world. Buster Charles finished 4th, just short of a medal. In 1933 Haskell moved away from its collegiate schedule and returned exclusively to high school competition by 1938. Through the Great Depression of the 1930s Haskell’s budget was cut by one-third (1/3), and it struggled financially for a period of nearly fifteen (15) years, but was able to maintain both its educational standards and athletic programs for the hundreds of students who continued to enroll during the same period of time. Tony Coffin (“Coffin”) began his coaching career at Haskell in 1938 when as an enrolled student at Kansas University he played baseball collegiately and was allowed room and board at Haskell. In order to pay for his Haskell room and board, Coffin was given the responsibility to coach Haskell baseball, boxing, and was utilized as an assistant in football. When the United States entered World War II on December 07, 1941, Coffin volunteered for military service in early 1942. At the conclusion of the War in 1945 he returned to Haskell to re-start his coaching career. In 1948 he took the reins as head coach in football, basketball, and track and field and by 1951 had Haskell athletics (at the high school level) back on the map, the football program between the years 1951 to 1961 compiled a record of 58-38-5. The basketball teams went to state championships twice (1953 and 1956), a remarkable feat considering the male high school enrollment never exceeded 200. In 1970 Haskell became an accredited junior college and through 1977 the school was able to maintain winning records with Cecil Harry being named the schools only juco All-American in 1971. Billy Mills (Sioux), 1964, an Olympic Champion in the 10,000 meter run. Jerry Tuckwin, 1970 to 1994. It is believed Phil Homeratha, long-time coach at Haskell, 1970 to 2012, the only Haskell coach to ever take three different Haskell teams to national basketball tournaments in three different decades, 1987, 1999, and 2008 will one day be in the National Indian Hall of Fame for his coaching achievements at Haskell. This represents a summary highlighting some of the most significant moments in Haskell athletic history and provides only a brief lesson as to the tradition of Haskell athletics that has emerged over the years. Unless those of us who appreciate the opportunity and life lessons Haskell has given us, their athletic program could possibly be either scaled down or termination of their athletic programs. So many Native American lives have been jumpstarted to successful careers and contributions to Indian Country because of the education received at Haskell. So many memories, experiences, and life lessons were provided ay Haskell. It’s hard to imagine a world without Haskell, a place where Native Americans who normally wouldn’t obtain an education beyond the limits of their reservations or urban difficulties. These students, past and present, felt more comfortable being around other Native Americans from all over the country. Different tribes, cultures and languages. But we all came from a world that didn’t and somewhat still hasn’t accepted us entirely or respected our culture and spirituality. Would you like to ensure that this traditional learning experience is there for your children, grandchildren and others in the future generations? Do what you can to keep the school open. So many struggling and goal oriented Native Americans who may not have somewhere else to go are depending on Haskell be there for their pursuit of excellence. If any individual or tribe is concerned and would like to assist the Haskell Athletic Program, you can contact the Haskell Indian Nations University Athletic Department at 155 Indian Ave., Lawrence, KS 66046, Tel. (785) 749-8459. Police opened an investigation Tuesday into a Saturday night incident in which a group of Native American students was reportedly subjected to beer baths and racial slurs while attending a Rapid City Rush hockey game. Rapid City Police Lt. Mark Eisenbraun said his department had just opened an investigation into the matter Tuesday afternoon. Also Tuesday, a witness stepped forward with more information about the incident. Andy Hollander, of Sturgis, a season ticket holder and longtime former supervisor of officials for USA Hockey, said he was 10 to 15 seats away from the American Horse School group from Allen, which had a total of 65 tickets for students and their chaperones. Hollander said the student group was one of the best-behaved he has seen in his years of attending games. Hollander said he was too far away to hear what happened, but he saw two men in the skybox above the students “who seemed to be taking real pleasure in continuing the confrontation” with an adult member of the school group. The group left before the end of the third period of a game that went into overtime and a shootout, with the Rush eventually losing to the Wichita Thunder 4-3. “It was a very exciting finish, and they missed it,” Hollander said. He hopes the men in the skybox will apologize publicly to the kids and be barred from attending future events at the Rushmore Plaza Civic Center, and he hopes the students will be brought back for another game and given a few perks. Meanwhile, the Rushmore Plaza Civic Center’s director and the president of Eagle Sales said Tuesday they were devastated by the episode. Eagle Sales of the Black Hills President Tom Helland called the incident “incredibly horrible.” Helland, a beer distributor, rents the arena suite from which one person, and possibly as many as three others, slung beer and racial epithets at the group of fourth- through eighth-graders from the school’s 21st Century Club, who were seated below. Helland, who was not at the Rush game, said one of his employees was in attendance, but neither that employee nor most of the other 20 people in the suite were aware of the incident. He said he had not yet been able to identify the offending individuals. Eisenbraun said it was too early to know what tack the probe would take. Earlier Tuesday, the police spokesman noted that Chief Karl Jegeris had been in conversations with civic center staff about the incident. The episode comes just weeks before Rapid City voters go to the polls March 10 to decide the fate of the proposed $180 million expansion of the civic center. At a Tuesday morning coffee klatch at which the planned expansion was discussed, Payu Harris told attendees the incident made supporting the proposal problematic. “I’m hearing words like ‘boycott,’” Harris said. “How do I go back (to other Native Americans) with that positive message” that they should vote for the civic center expansion? Baltzer said the incident would undoubtedly lead to enhanced security at the civic center as well as additional training for staff. Asked if the entire incident could be attributed to over-consumption of alcohol, Baltzer said he had no way of knowing if drinking contributed to such behavior. “It’s hard to catch everything when there are 5,000 people in attendance,” he said, sighing. “I think it is possible they were mental midgets with the added courage of drinking, but I don’t know. I did get a report they were drinking beer, but I don’t know their stage of drunkenness. “We do refuse admittance to people who are clearly too intoxicated. We do cut people off just like a bar, or we eject them, or there can be further action,” Baltzer added. Calls seeking comment from American Horse School Principal Jodi Richards, one of the student chaperones at Saturday night’s game, were not immediately returned Tuesday. In this photo taken Sept. 25, 2014, students walk between buildings at the Little Singer Community School in Birdsprings, Ariz. on the Navajo Nation. Like other schools in the Interior Department’s Bureau of Indian Education, remoteness, extreme poverty, bureaucracy and a lack of construction dollars have enhanced the challenges at Little Singer. The Obama administration is pushing ahead with a plan to improve the schools that gives tribes more control. But the endeavor is complicated. 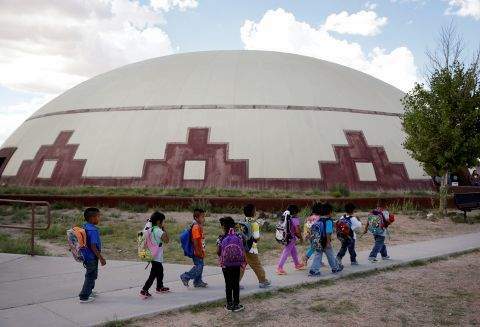 WINSLOW, Ariz. (AP) — The federal government finances 183 schools and dormitories for Native American children on or near reservations in 23 states. The schools are some of the nation’s lowest performing. An effort is underway to improve them. The Obama administration wants to turn day-to-day operations of more of the schools over to tribes, bring in more board-certified teachers, upgrade Internet access and make it easier to hire teachers and buy textbooks. The plan also seeks to provide more support to schools to advance American Indian languages and culture. But many the schools are in poor physical condition. An estimated $1.3 billion is needed to replace or refurbish rundown facilities, and not much money is coming from Washington. There also is much mistrust of the federal government, given the history of forced assimilation. The system of government boarding schools to educate Native American students was established in the 19th century as part of an assimilation policy to “eradicate Native cultures and languages through Western education,” according to a government study group. One of the first to be run directly by Washington was the Carlisle Indian Industrial School in Pennsylvania, which opened in 1879. It was founded by Richard Henry Pratt, an Army officer who said, “Kill the Indian in him, and save the man,” according to Jon Reyhner, an education professor at Northern Arizona University. In 1966, what was then called the Rough Rock Demonstration School opened in Chinle, Arizona, a prototype of the schools that are today owned by the federal government but run by tribes. While about 7 percent of Indian students attend a bureau school today, the great majority are at traditional public schools. Only a few bureau schools fully immerse students in a Native American language or culture. Others offer them in lesser degrees. But this type of instruction is a draw for parents. About 6,900 students live in dorms operated by the bureau. Little Singer Community School outside Winslow, Arizona, was the vision in the 1970s of a medicine man who longed for area children to attend a local school. Today, it serves 81 students and school leaders emphasize a nurturing environment. But the rundown classroom buildings have problems with asbestos, radon, mice, mold and flimsy outside door locks. The school has been on a government priority list since at least 2004 for new construction. Indian students overall score higher overall on assessments than those who attend bureau schools. Native American students overall have high school graduation rates that are lower than the student population as a whole, 68 percent compared with 81 percent, according to government figures from 2011-2012. They also lag peers on a national assessment known as the “nation’s report card” and have lower rates of college completion. In a 2011 survey conducted as part of the national assessment, 56 percent of Native American and Alaska Native students reported knowing some or a lot about their tribe or group’s history. The rest reported knowing little or nothing. There isn’t a word for cancer in most indigenous languages, yet it affects Native Americans at an abnormally high rate. The Partnership for Native American Cancer Prevention (NACP), a joint effort between Northern Arizona University and the University of Arizona Cancer Center, is the recipient of a $13 million grant from the National Cancer Institute, that will be split between the both universities. “People die of cancer in Native American populations higher than other groups,” said Jani Ingram, associate professor of chemistry and biochemistry at NAU and member of the Navajo Nation. According to the Intercultural Cancer Council, cancer is the third-leading cause of death among Native Americans, but there is no conclusive evidence to determine why. 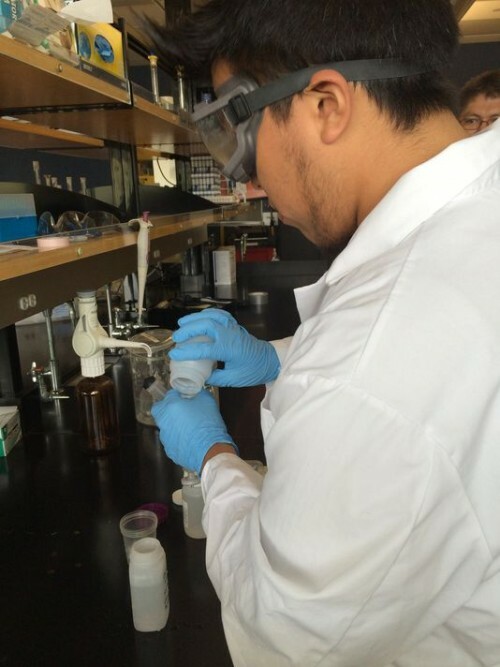 Since 2002, NACP has worked to understand the reason cancer affects Native Americans, specifically tribes in the Southwest, at higher rates and seeks to engage Native American college students in entering science fields to help further research. NAU’s program has 10 student researchers working under Ingram, some whom have been personally impacted by the deadly disease. “It started with my grandfather, who worked in uranium mines and he died from lung cancer,” said NAU senior Erik Peaches, who is of Navajo descent. In recent years, cancer spikes among older Navajos have been attributed to uranium exposure, a mining industry that boomed on the Navajo Reservation during the 1950s. The radioactive element still threatens communities surrounding abandoned mines and even contaminates drinking water. NAU senior Ethan Paddock’s grandmother battled breast cancer that he says was caused by uranium exposure on the Navajo Nation. After a round of chemotherapy, Paddock’s grandmother has been declared cancer-free, but most with the disease don’t have the same outcome. The grant money will continue the research being conducted in the Hopi, Navajo and Tohono O’odham communities, work that Ingram said more Native American students should consider. “If it is a native student, a Navajo student, a Hopi student working on an issue that’s really important to their community, the passion is just right there,” Ingram said. Green Bay — Students at the University of Wisconsin-Green Bay who want to learn about the state’s American Indian tribes don’t turn to books, but to tribal elders who live on nearby reservations and keep office hours in Wood Hall. It’s a unique opportunity for any student on campus to sit face-to-face with a tribal member who is a repository of knowledge and wisdom passed on to him by his elders — everything from tribal beliefs and teachings to tribal culture, language and faith in the Great Spirit, the Creator. Green Bay is within 100 miles of five Indian reservations for the: Oneida, Menominee, Ho-Chunk, Stockbridge-Munsee and Mole Lake. The Oneida reservation is on the city’s outskirts. It would be logical to assume UW-Green Bay draws a large number of Native American students with its proximity to tribal lands. But like the rest of the UW System, UW-Green Bay’s enrollment of Native students is flat, while the numbers of other underrepresented minorities are growing. Last fall, only 98 of UW-Green Bay’s 6,667 students were Native American. Systemwide, 679 of the 154,446 undergraduates at campuses across the state identified themselves as Native Americans — 0.4% of the total enrollment. In an effort to better understand why that is — and what can be done to help more Native American students in Wisconsin earn college degrees — the UW System Board of Regents invited leaders of the Great Lakes Inter-Tribal Council to join them Friday at an unprecedented meeting in Stevens Point. It may be the first time tribal leaders have sat down with leaders of the state’s system of higher education, UW officials said. UW Regent Ed Manydeeds and UW System President Ray Cross attended a Great Lakes Inter-Tribal Council meeting in July to extend the invitation. “The history that happened to these people didn’t happen that long ago,” said Manydeeds, the first Native American regent and a member of the Standing Rock Sioux Tribe. Wisconsin’s Native American population is about 1% of the total population, but the numbers have increased 12.6% since the 2000 census. The state has 11 federally recognized tribes. About 45% of the Native American population is in the state’s metropolitan areas; 13.7% (7,313 people) lived in Milwaukee County in 2008. UW-Oshkosh last year had the UW System’s highest Native American enrollment (117), followed by UW-Milwaukee (114), UW-Madison (112) and UW-Green Bay (98). The Wisconsin Technical College System has about twice as many Native American students as the UW System. The state’s two tribal colleges have about the same as the UW System. Increasing Native American enrollment may require a shift in campus culture, according to tribal elders at UW-Green Bay. There’s a need for non-Native students to understand and respect Native American culture, and a need for Native students to feel like they fit in on college campuses. UW-Green Bay has a First Nations Studies program that focuses on Wisconsin’s Native American tribes and bands, and is considered a model for building understanding and respect of tribal cultures. It reaches students who are interested in a First Nations Studies major or minor, students learning to be teachers, and students in general education classes such as history. David Voelker, an associate professor of Humanistic Studies and History, set out several years ago to fuse First Nations content with his American history classes because he wanted to teach in a way that was relevant and respectful. 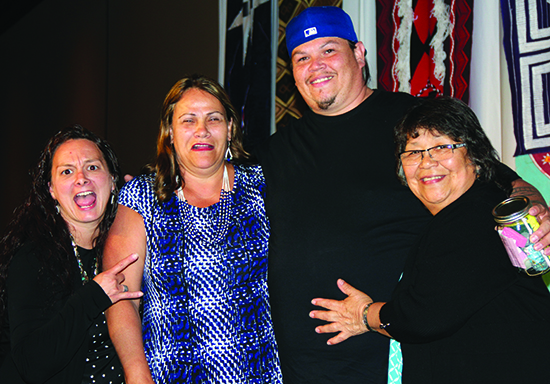 He has learned from tribal elders and colleagues in the First Nations Studies program. 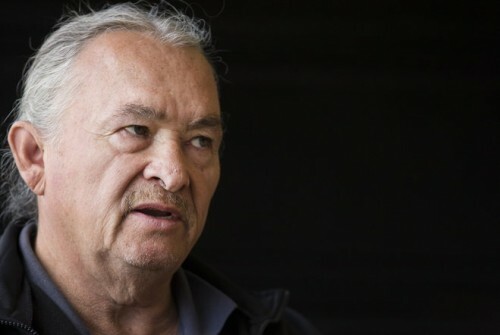 “Part of it is reminding everyone that First Nations still exist,” said Voelker, who grew up in Indiana and had only a rudimentary exposure to Native American history while working toward his master’s degree and doctorate in American history. Tim Kaufman, chair of the Education Department, considers the elders in residence the heart and soul of the Education Center for First Nations Studies. Students learning to be teachers take courses in First Studies and meet with tribal elders to help them better understand Wisconsin’s tribes so they can teach specific content in K-12 schools, as required by Wisconsin Act 31. “One of the real focuses on this center and the program is interdisciplinary connections,” Kaufman said. The First Nations Studies program teaches history, sovereignty, laws and policies, and indigenous philosophy. Students also learn about the contemporary status of bands and nations, according to Lisa Poupart, associate professor of Humanistic Studies, First Nations Studies and Women’s Studies. Poupart is chair and adviser for the First Nation Studies program, and is an enrolled member of the Lac du Flambeau Band of Lake Superior Anishinabe (Ojibwe). Menominee elders David “Napos” Turney Sr., and Richie Plass enjoy sitting down with students who stop by the First Nations Studies office in Wood Hall to ask questions. Many of the students are non-Native, and know nothing about Native culture. They talk about everything from the degradation of school mascots to cultural stereotypes. For example, “everybody thinks if you’re Native American and have a casino, you’re rich,” Plass said. Plass, a published poet, was an Indian mascot in high school in 1968, and remembers traveling to another school where students threw banana peels, orange peels and paper cups at him. Then they spit on him. “To me, there’s no honor in having people laugh at me, throw food on me and spit on me,” he said. Plass travels around the country with an exhibit he created on Native American imagery, showing both the “good” and culturally correct items from Native American culture and the “not so good” images, such as school mascots. Turney said when he meets students, he asks who they are, where they are from and whether they have ever been around Native Americans. He is a Vietnam War veteran. He also works with students in Green Bay schools as a traditional elder in residence for the Title 7 cultural program. Turney teaches Menominee at UW-Green Bay and in Green Bay public schools. Today, there are only five first-language Menominee speakers on the tribal rolls of 9,000 people, he said. Turney and Plass sat deep in thought when asked why there aren’t more Native American students on UW campuses. Part of it is the devastation of addiction on reservations, they said. “There’s some very smart Indian kids who didn’t graduate from high school because they were cutting the rug,” Plass said. Tribal colleges on tribal lands have helped raise the numbers of college educated American Indians, he said. Some Native Americans don’t realize they need a college degree until they are adults, Turney said. He didn’t earn his bachelor’s degree until he was 50. Why did it take him so long? It also can be hard for Native American youths to fit in on college campuses because there are so few students like them, Turney and Plass said. Plass said many youths just don’t want to leave the reservation — sovereign land where they can hunt and fish whenever they want. And then there’s racism. “That’s a very uncomfortable subject to come out,” Plass said. 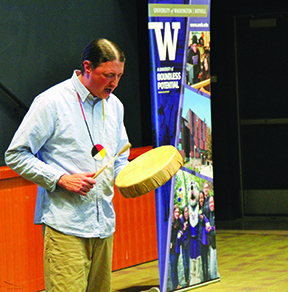 Turney recalled that the Inter-tribal Student Council on campus several years ago met resistance from the non-Native student government when they sought funding to serve Native food at a powwow. The Native students were angry and chose not to have the powwow as a friendly boycott. 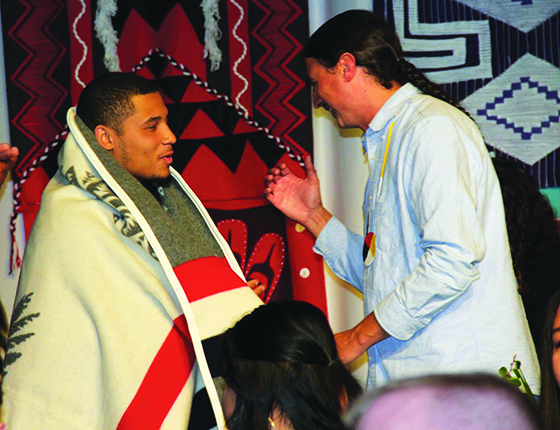 They brought the powwow back two years ago, when UW-Green Bay was recognized among the top schools in the U.S. for Native American students, said Turney, who was the group’s adviser. 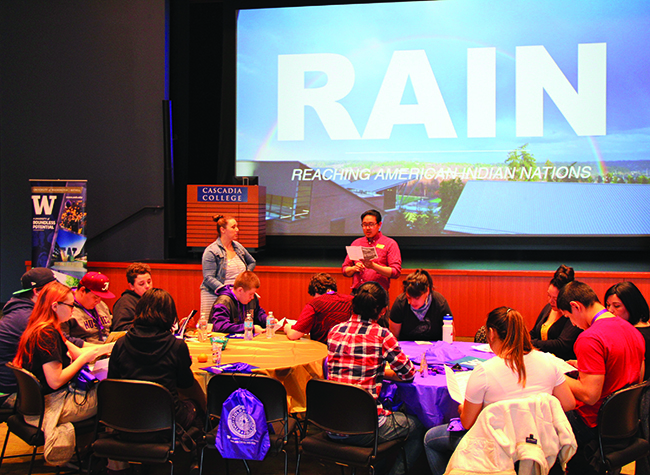 Native students look at the tribal elders in residence as campus allies. 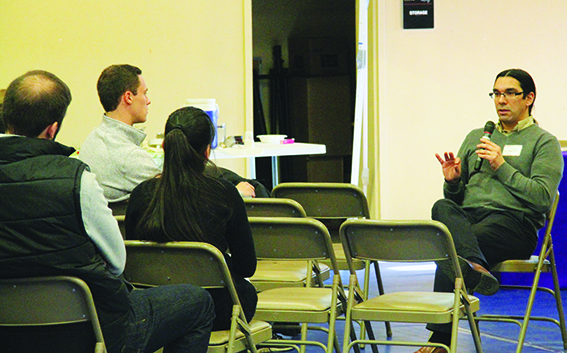 “We have to help non-Native students learn about us,” Turney said Native students tell him. Turney said he doesn’t preach going to college, but believes the key to success for Native American students is knowing who they are and taking pride in their culture. “If your roots are strong, there’s no wind that can blow you over,” he said.